Concerts are from 6-8pm in the Main Plaza. Help us spread Christmas cheer a little early this year! 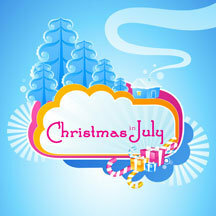 Richmond-based band “Offering”, Short Pump Town Center and 98.9 Liberty are hosting “Christmas in July”. This day-long event features Christmas concerts from local bands and “Christmas in July” specials highlight the need to live out the same generous spirit of giving to those in need in July expressed so well in November and December. All money and food donations benefit the Central Virginia Food Bank. Between 10:00am and 5:00 pm various bands will perform in the Main Plaza at Short Pump Town Center. Join us for Christmas music, bring food donations, and shop in a not-so-winter-yet-oh-so-sweet wonderland while providing support for hungry neighbors throughout Central Virginia. Jen Towner from 98.9 Liberty is among the emcees for the day, along with Santa who will make an appearance as well as various Holiday Children’s Characters! Guests are encouraged to bring non-perishable food items like canned tuna, peanut butter, and canned vegetables to help those in need. Guests will also enjoy entertaining face painting, a bounce house and several community groups will be hosting activities. In addition, there will be special one-day only sales offers, food & drink samples from the Town Center merchants, fun children’s characters including the Chick-fil-A Santa Cow will be roaming throughout the day and a Christmas themed coloring station will be on hand for kids to enjoy! Retailers have offered some nice coupons in the past years. Don’t forget your donations for the food bank!